Two memorable things greeted him: a man who looked like a character from Deliverance and “the biggest dog in the world.” The Saint Bernard growled at King, but the man assured him that “he don’t bite.” King reached out to pet the dog and it went for him. The man walked over to the dog and gave him a whack with a socket wrench. The dog yelped and sat down. It had never done anything like that before, the man said. “He must not have liked your face.” King had no place to hide if the dog decided to attack him. The motorcycle wouldn’t run and he couldn’t outrun the dog, which probably outweighed him. He started wondering about the smallest operant area in which he could set a novel, and the answer he came up with was a Ford Pinto. King had used part of his initial $3500 advance from Carrie to purchase just such a car. They were still driving it at the time of his run-in with the Saint Bernard, even though the used vehicle had never run well. He imagined a scenario where his wife took the car to the mechanic and ended up trapped in it because the man wasn’t around. He saw it in terms of a Mystery of the Week TV movie with a single setting and a stationary camera. King had read about certain kinds of dogs being overbred, causing genetic weaknesses. There had been a recent article about a child in Portland, Maine being bitten to death by a Saint Bernard. However, instead of relying on such a complex explanation for the dog’s behavior, he came up with a solution everyone would recognize: rabies. At first he considered giving the mother rabies so that the main conflict would be her struggle to keep from hurting her son while overwhelmed with madness, but he learned that the gestation period for the disease made that scenario impractical. Reality dictated the terms of fiction. He then had to conjure up a situation that would leave mother and son isolated for days—hence the lottery win that takes the [surviving] Cambers away from the farm unexpectedly. Cujo was the nom-de-guerre of William Wolfe of the Symbionese Liberation Army. According to King, Wolfe believed the word meant “sweet one” in Spanish, but he claims that it doesn’t appear in any dictionary. That was one of the reasons he liked the word: because of its impenetrable nature. Though Cujo has a strong sense of place—Castle Rock, Maine—much of the book was written during the King family’s relocation to England in the fall of 1977. King wanted to absorb some of the British atmosphere to write a book set in a fictional version of Fleet, Hampshire, but the reality of the atmosphere—in particular, the perpetual cold they felt in their house—caused them to cut their planned year-long visit short, by about nine months. King’s most controversial decision in writing Cujo was allowing Tad Trenton to die. It wasn’t a conscious choice, he has said: it just happened. In a 1988 interview with Janet Beaulieu of the Bangor Daily News, King said he knew readers wouldn’t like this ending and, being a people pleaser, he tried to rewrite it so that Tad would live, but it came out tinny and false. He did not object, however, when the moviemakers allowed the boy to live. “Movies aren’t real,” he explained. However, that wasn’t the most difficult scene for him to write. That honor fell to the scene where Donna admits her infidelity to her husband. He wanted the scene to be fair to both of them. Neither would end up being the villain. It took him two days to develop a scene that he might otherwise have written in a couple of hours. The problem wasn’t in how to frame the sentences but in trying to understand why the characters—especially Donna—were doing and saying what they were. In retrospect, King has said that his answers to those questions aren’t perfect, but they are honest. During a 1982 appearance in Dayton he said that he didn’t think the book was a tremendous success in a lot of ways. 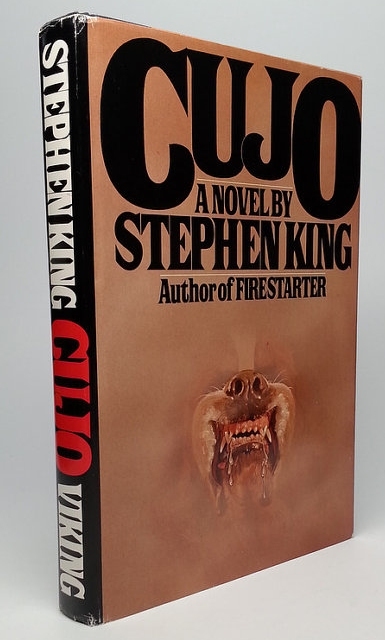 Cujo was published in October 1981, with a first printing of 350,000 copies and a limited edition of 750 numbered copies issued by Otto Penzler’s Mysterious Press. King initiated this limited edition and Penzler later said that King’s generosity in allowing him to do this edition probably kept him in business. The British book King attempted while living in Fleet was Wimsey, featuring the protagonist of a series of novels written by Dorothy L Sayers. Only the first chapter (14 pages) of this aborted novel is known to exist. While overseas, King did get the chance to visit with Peter Straub that October, an experience that gave rise to the short story “Crouch End.” During their meeting, they first discussed the possibility of writing a book together, though their schedules pushed this onto the back burner for several years. The only SK book that I have not read more than once. Love my dogs too much; I can’t stand to think of one becoming a killer. Since I read it the first time back when it was originally published, maybe now a little more than 30 years later I can think about picking it up again. Not one of my favorites by any stretch but then as now—-If HE writes it–I Read it. And as the previous poster said, I’ve reread most of his books but not this one–again the dog thing I think. Dee Wallace turns in a powerhouse performance in the movie version. Worth watching for that reason alone. It’s either sobering or leads to drink – depending on your state of mind – that King was able to write this book during a period of his life that he barely remembers. i enjoyed the early books including this one! Pet semetary still sticks with me though. Very interesting background info. Thanks for that. I re-read this a month or two back, as part of this project. It is a fairly grim and relentless book, ending badly. One of those books where you don’t really sympathise with anyone much. I can’t see myself re-reading it again. It seems, now, very much a book of it’s time (late 70s/early 80s). I kept thinking “Well, nowadays, she’d just use her mobile phone to call someone” and similar. Not my favorite King story (The Gunslinger still tops the list), but an okay King story is still better than a good story by ‘most anyone else. Wanted to hear more about what was in that closet, though. Sequel, anyone? I have always been a dog lover. I still remember watching the movie when I was somewhere around 6 and it scaring me more than anything ever had. Just the thought of a dog being the monster threw my little world into a spin. The book never really bothered me when I read it many years later. Maybe because in the book you never know if maybe the dog is possessed. I like to think he was. I’m sorry.but it is THE ONLY book that I ABSOLUTELY REFUSE to read by the MASTER Horror writer. Can not stand to read about an animal’s decent into madness. WAY too much of an animal lover. Have to wonder if this book had been written – ignoring cell phones etc. – today by King if he would have written the ending differently. Much like if he had written Finders, Keepers back in his Cujo days if one event near the climax would have been handled differently. Again, great job Bev!! But, every time I think of Cujo, it upsets me so that the poor dog becomes such a maddened creature. Well, it saddens me too when I think of the ending, and how it all had to come about. To have a book disturb me so just shows what a wonderful author SK is.